No Worries: 4 bed / 2 bath. Sleeps 12. Put it all aside, unwind and breathe just a little bit easier. Let No Worries cabin help you relax! This remodeled and updated cabin has been designed to make your family vacation as hassle free as possible. A full kitchen with all the cookware and dinnerware you need to prepare your family favorites will be at your disposal. A pool table sits next to the living room so everyone can play, visit, and watch the big game. And with free wifi – everyone can stay connected. The bedrooms have top of the line mattress to make sure you can rest easy. There are 2 king size beds, a queen size guest room, and a bunk room that has dual twin over full bunks – kids will love it. But don’t get to comfortable inside – No Worries offers a lot to do outside also. The cabin sits on 5 acres set aside from a working ranch and hay fields. No Worries has a huge, level yard – great for games and letting kids run. They can take turns on the tire swing or bring some bikes and let them ride. As evening falls, everyone will enjoy gathering around the fire pit, telling stories, and eating s’mores. On the deck is a large, private hot tub perfect for finishing up the day. 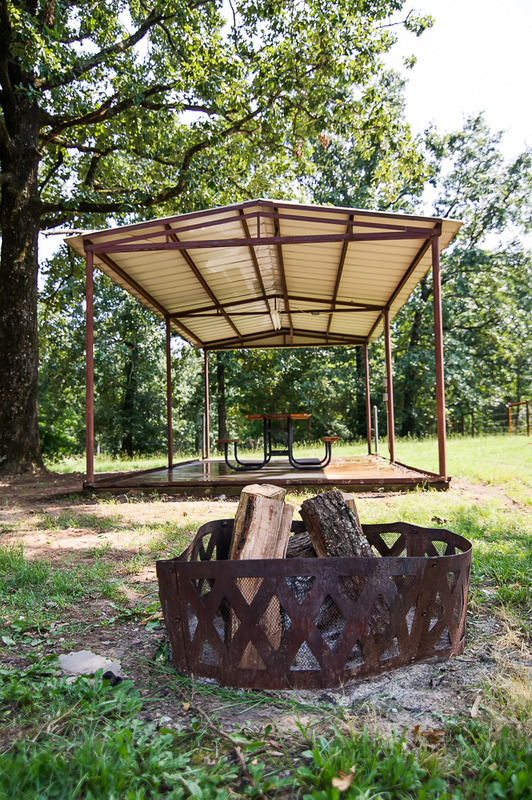 If big family cookouts are on the menu – you will appreciate the charcoal grill and covered pavilion as well. No Worries is located just a short drive from Hochatown, Beaver’s Bend State Park, and Broken Bow Lake. This means you are close to all the activities. You can spend the morning trout fishing on the Lower Mountain Fork River, and then spend the day on the lake or kayaking. Be sure to schedule some time for horseback rides, putt-putt golf, zip lining, and so many of the other available adventures. Even though you will have access to a ready to cook kitchen, don’t miss out on the many great restaurants we have to offer. You are welcome to bring your ATVs to enjoy on our local forestry roads that have been designated for ATV use. No Worries is still a producing hay farm and improper use of the ATVs can destroy a field, so we do restrict you from riding the ATVs in the pasture. And of course, ATVs are not allowed on the pond bank either. This cabin is pet friendly. Guests may have two (2) small dogs with a $20 per night non-refundable pet fee. All dogs must be kenneled if left alone at the cabin. Pets are not allowed on the furniture or in/on the beds otherwise additional cleaning fees may apply.